Holidaymakers have been warned of travel chaos over the Easter weekend as Network Rail plans 100 million pounds of upgrades over the bank holiday. 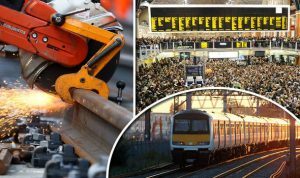 As 13,800 engineers are scheduled to work ‘around the clock’ to make improvements to the network, thousands of passengers across the U.K. will face delays and disruption. The Easter travel chaos will spill over to journeys including alternative routes, longer travel times and busier trains than normal as per Network Rail. London’s Euston Station will be most heavily affected with no trains in or out of the main line station on days – Easter weekend (April19-22) and early May bank holiday weekend (May 4-6). The improvements at Euston are in preparation for HS2, Britain’s controversial new high-speed railway. It includes work to clear additional concourse space to help customers move more freely around the station. Gatwick Express services will not run on Good Friday and Easter Sunday and trains between Manchester and Liverpool Lime Street will terminate at Hunt’s Cross on Easter Sunday, with buses completing the journey. The railway is up to 50 per cent quieter than usual over bank holidays so doing work at this time of year minimises the impact on passengers. Andrew Haines, chief executive of Network Rail says that in order to avoid Easter travel chaos they are strongly advising passengers to plan ahead due to essential upgrades to the rail network to improve their journeys. On Easter Sunday, buses will replace trains between: Colchester and Norwich, Ipswich and Bury St Edmunds, Colchester and Harwich Town and Norwich and Lowestoft/Great Yarmouth. The line between Birmingham International and Coventry will be closed at Easter, while Services to and from London St Pancras International will be amended.